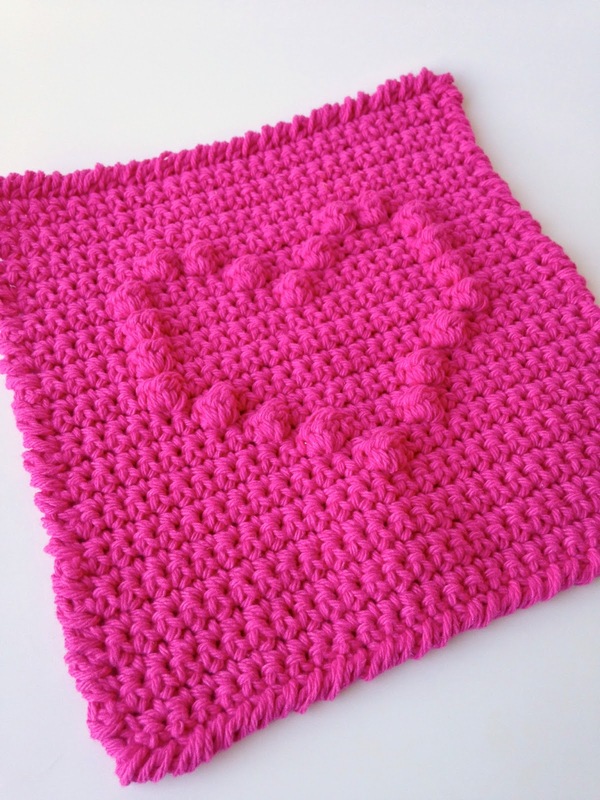 Time for dishcloth number 2, The Bobble Heart. This one turned out to be one of my favorites. 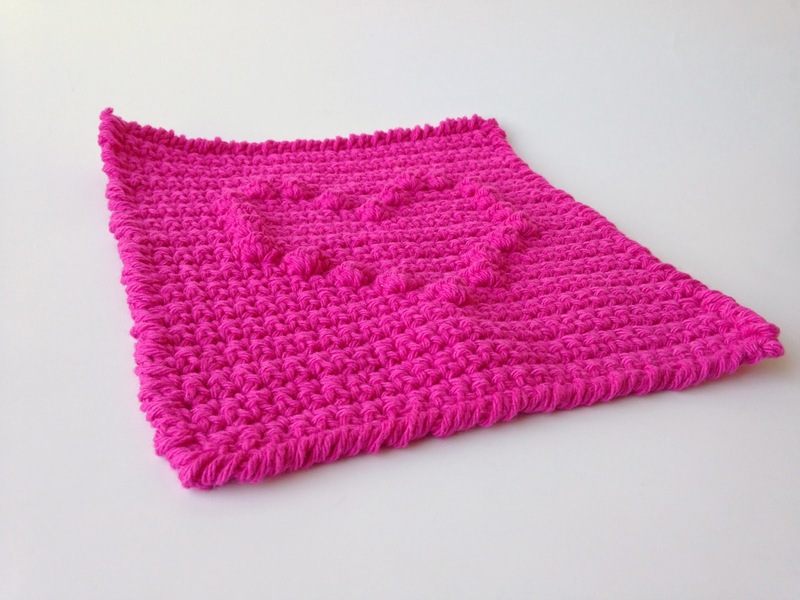 It is mostly single crochet with 3 double crochet bobbles used to create a heart shape. It is pretty simple to make, you just need to pay attention to the number of stitches to make sure you put the bobbles in the right place. I had to play around with the bobbles a little bit to get the heart to look right. My first attempt got unraveled and re-done but I was happy with the end result. This was one of those things that I got the idea and pictured in my head but I had never tried it before so I had no idea if I could make it work. It was kind of fun to see that idea take shape and turn out just like I had imagined. Well, at least on my second attempt. There are only three different stitches used for this dishcloth. The background is all single crochet. In fact even in the heart section every other row is all single crochet. All of the even, or right side, rows will be single crochet. 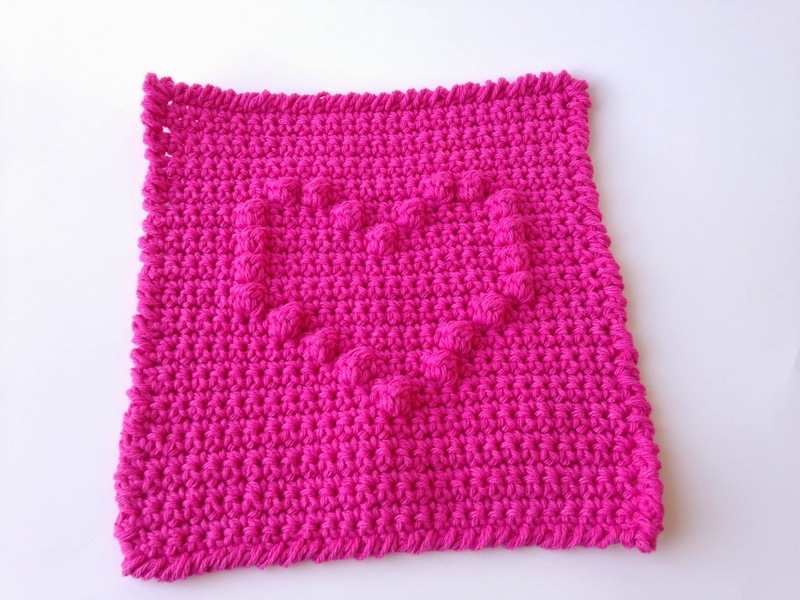 The heart shape is made using 3 double crochet bobbles. If you aren't familiar with how to make bobbles I will explain it, if you are you can just skip the next paragraph. The last stitch is the reverse single crochet that I used for the border. The bobbles are worked on the wrong side rows so when you make the bobble it will pop out away from you. 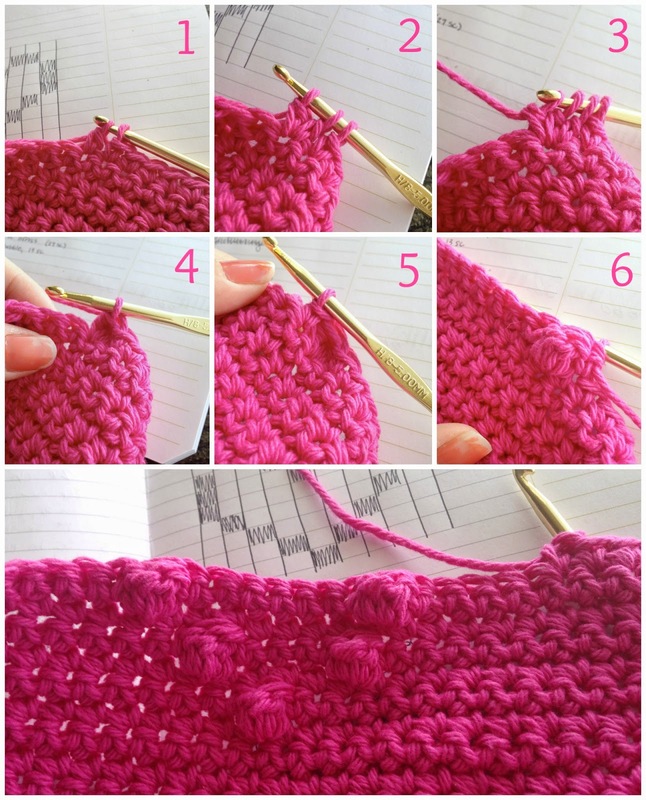 You will start the same way you would a normal double crochet. Yarn over, insert in stitch, draw up a loop, yarn over and pull through 2 loops (see picture 1 above). Instead of finishing that stitch you will yarn over again, insert in the same stitch and draw up another loop, yarn over and pull through 2 loops. This should leave you with 3 loops on the hook (see picture 2). Repeat that one more time and you should end up with 4 loops left on your hook (see picture 3). Now you will yarn over and draw through all 4 loops (see picture 4). The bobble is now complete. The next stitch will be a single crochet and making that stitch will really make the bobble pop and help it hold its shape (picture 5). Now, in order to really see the bobble that you just made you will need to flip your work over. There you should see a nice round little bobble (picture 6). I made this chart to show where to make the bobbles for the heart. 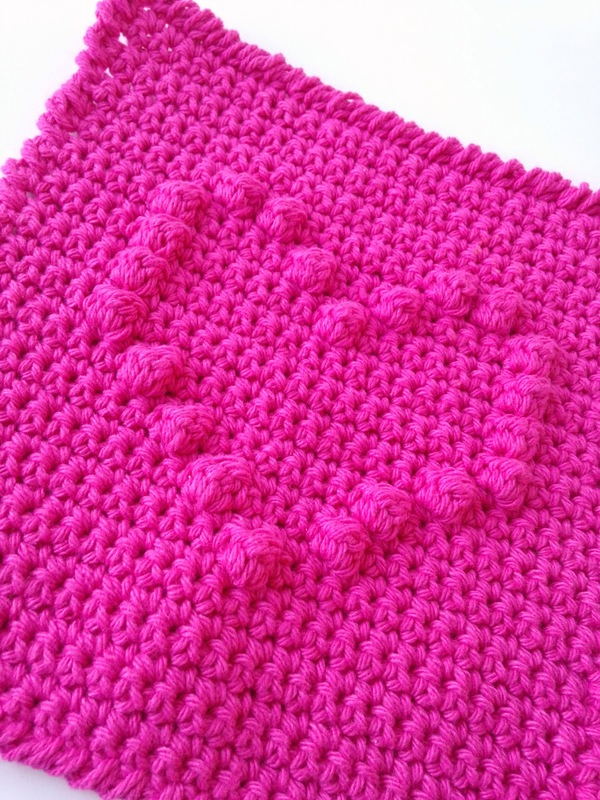 The pink squares are bobbles and the white ones represent single crochets. 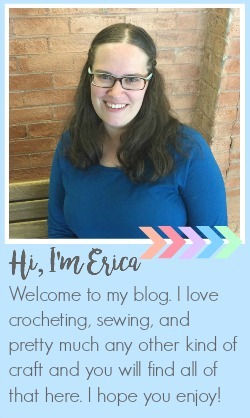 I did not include all of the single crochets above, below, and to the sides of the heart. 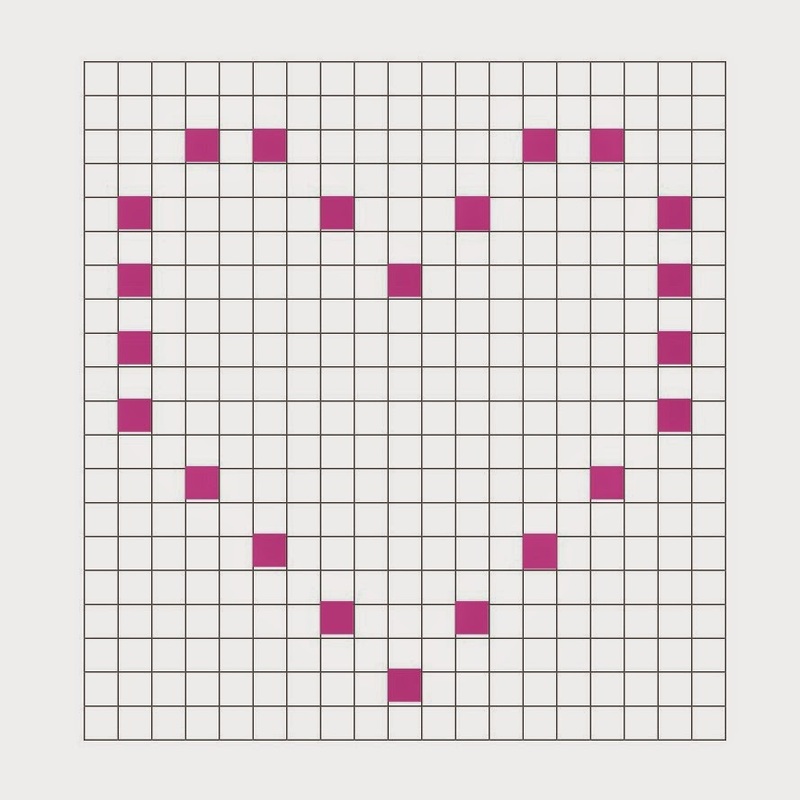 The chart only shows 1 single crochet on each side but there are actually 5 single crochets on each side of the heart. 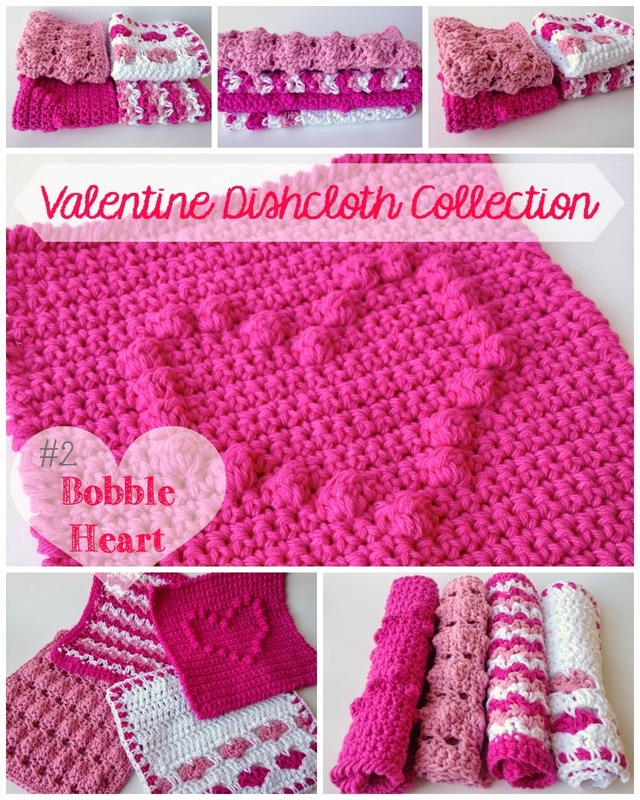 You could use this chart to put a bobble heart on anything not just a dishcloth. For the border I did a reverse single crochet all the way around. Reverse single crochet is basically just a single crochet worked from left to right instead. Instead of turning your work to start the new row you will just work in the opposite direction. 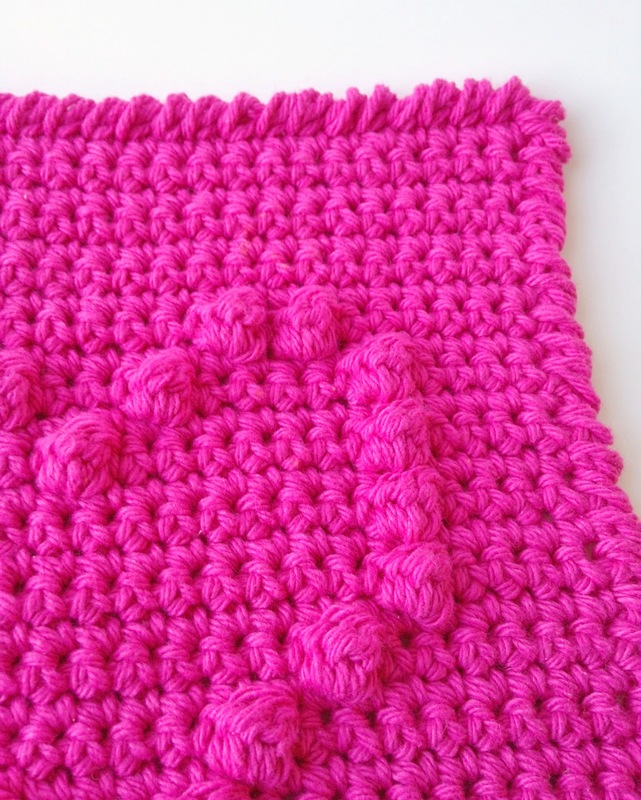 Here is a link to a tutorial if you are not familiar with this stitch. Once you have completed your border, weave in your ends and you are done. Enjoy your fun new dishcloth. Adorable!! We always try to give a jon food gift to the widows in our neighborhood for Valentines Day. These will be perfect. Can't wait to see the rest. Thanks for sharing. Too lovely! ! Thank you for sharing pattern! Beautiful! Thanks for sharing. They make brilliant gifts.